It's been a while since last time I made jams and marmalade. This year, summer inexplicably went by without leaving any trace between my cupboard's jars. An unforgivable mistake, indeed. Inspiration magically came to me when I laid my eyes on, ehm...no, when I took possession of this thing here. Finally a book on jam making worthy of Christine Ferber, a 372-page volume full of irresistible colors and fragrance, a true ode to fruit, with a slightly retro style that won my heart. Blue Chair Fruit is a fairly famous name here, some sort of cult for all those who happily hang out at farmers markets and specialty bakeries on Saturday mornings, a love song for the simplest of all breakfasts, a celebration of local and seasonal products, and yet another embodiment of the American dream. Ok, I have to admit I'm a little biased, but trust me for now, and then, when you happen to be around here, I'll reward you with a tour de force on the streets of San Francisco, hunting for meyer lemons, early girl tomatoes, pluots and cranberries. ripe pears, net 1,300 gr. Peal and core pears, and cut them in small cubes. Add sugar and juice of lemons, and mix well. Cover with plastic and refrigerate overnight. The next day, pour everything in a large pot and bring to boil, stirring every once in a while. Let it cook for about 20 minutes, then puree about 1/3 of the mixture. Pour it back in the pot and keep cooking for another 20-30 minutes, or until jam reaches desired consistency, skimming when necessary. 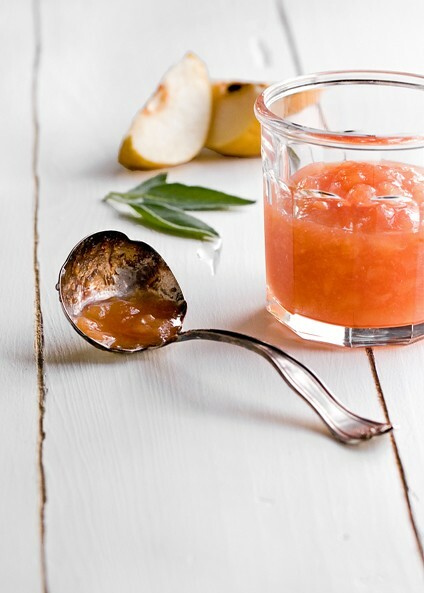 Add apple cider vinegar and one tablespoon of chestnut honey, stir well and cook for 1-2 minutes longer. Turn off the heat, add sage leaves, previously washed and pat dry, and let them sit for about 6-7 minutes (don't worry, their taste will become less intense once jam cools down). Discard sage, then pour the jam in cleaned and properly sterilized glass jars. Cover with lids, place the jars in a pot of boiling water, and boil for 20 minutes. Turn off the heat and let the jars cool off in the same water to create vacuum.